Interesting analogy but the reality is that companies really don't invest enough time defining exactly what they want a role to achieve and the behaviours and skills they need candidates to have to excel in the role. I also agree that so many companies have one way of interviewing or assessing candidates no matter how junior or senior the role is. I am always shocked when clients tell me they will be setting an hour aside to interview candidates to fill one of their critical Board roles following which a decision will be made! Of course we don't let that happen but left to their own devices they would. Recruiting employees is an investment in the most important capital you can acquire for your business and should be treated as such. When did you hear of a manufacturing business buying a new £2 million production line when they didn't know what they needed the technology to do and set aside an hour to make the decision? It doesn't happen!! When purchasing footwear most people would go to a different shop to buy running trainers than they would for ‘fashionable’ shoes and you would hopefully select each of these purchases using very different criteria. But it is probably fair to say that a lot of SMEs would not alter their selection process whether they are looking a Marketing Assistant or a CFO. The advert copy may differ, but a responsive recruitment strategy will be selected, the same advertising channels chosen and the interview process is likely to be the same, all be it with a few tweaked questions so that they are specific to the role. 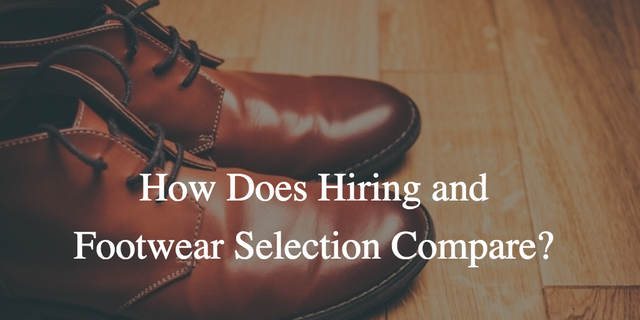 But as with our footwear it would be much more beneficial to think about the requirements, where the appropriate solution will be found and the criteria for selection before the recruitment process begins.